Garden produce is finally happening at our home. We have picked several things and lots more are on the horizon. 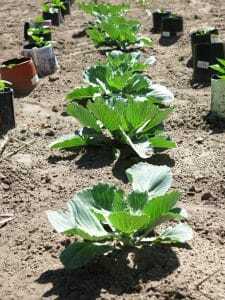 I have plants in all different stages in the garden, as I am sure many of you do. I hope to do some fun things with all our produce and share them with you this summer. One area of the vegetable realm I have not ventured into yet is “greens.” You know, mustard greens, dandelion greens, spinach, kale, beet tops. I guess I am just not ready back in February or whenever it is you start these little rascals, but I do enjoy visiting the farmer’s market and buying them. 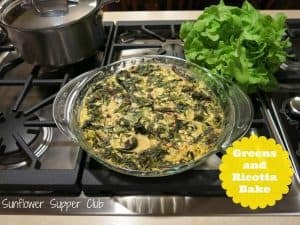 I made one of my favorite ways to consume these greens the other night and thought I would share with you. Spring and Summer always bring on a healthier, lighter way of cooking in my kitchen, and this recipe reflects that. You can use any kind of greens or mixture that suits your fancy – I used kale and beet tops the other night. Let your imagination run wild! In a large skillet heat oil on high. Add the greens, green onions, and garlic and cook tossing gently until wilted. Place this in a large bowl and mix with the ricotta cheese. Mix the egg yolks and cream together and add to the other mixture stirring until mixed together. Place in a deep dish pie pan and bake for 25 – 30 minutes or until set.